It was midnight at Prince Rupert’s ferry port. Our ship, the Northern Expedition, was lit up like a Christmas tree, gleaming gold and white against the gloom at the end of the pier. The fact that we’d waited an extra day for her due to rough seas made her seem all the more extraordinary. The same bad weather had kept us up the night before; we’d got about 5 minutes sleep between us as 100 km/h winds threatened to tear our tent in half. We rushed to the head of the small group of “walk-ons” once called aboard. We’d been told by locals there would be a race for the all the good spots on the covered rear deck. We were actually giggling with excitement. I staggered from the weight of the food we’d packed for the 18-hour, 500 km journey, which included enough cocoa, brown sugar and powdered milk to make hot chocolate for a pod of orcas. We arrived at the rear of the highest covered deck and scratched our heads; obviously those who’d advised us to make a run for it were talking about a different boat. There was nothing spectacular about our “quarters”: fluorescent-lit, wet metal chairs screwed to a weather-treated metal floor. We’d been told to look for heating vents over lawn chairs. We were too exhausted to seek out new digs, however, and unfurled our bag next to a locker of some sort. There we slept in the brisk sea air, lulled by the churning of the ship’s propellers. There were only about 50 of us on the 600-passenger-capacity vessel; we could have slept anywhere on the ship. It seems somehow fitting we camped outside. We dozed about 3 or 4 hours as the Northern Expedition crawled through the blackness. When the sky started to pale, we got up and leaned our elbows on the rail. We’d ridden over 2500 km without a glimpse of the Pacific Ocean. Now at last we could lay eyes on what will be our constant companion for months to come. 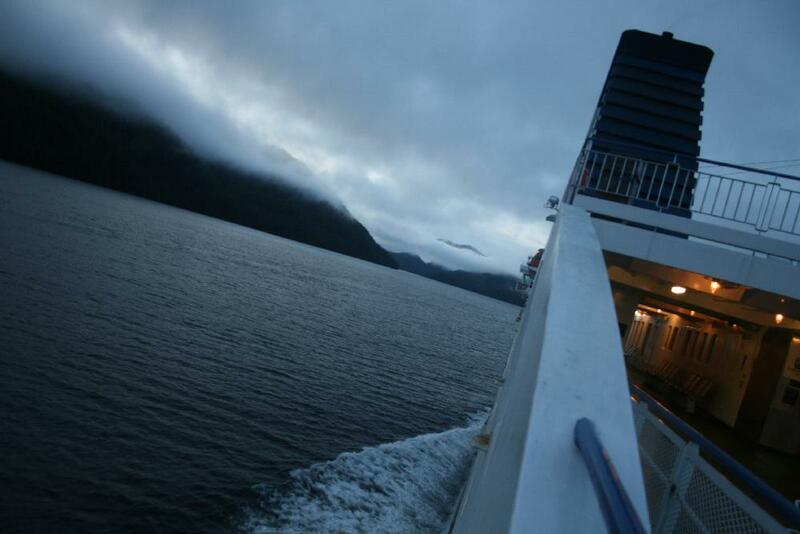 The view was absolutely incredible – endless forested mountains rising right out of the sea. We were treated to a sunny day, apparently something of a rarity in the area. In the afternoon we saw humpback whales off the bow! We rolled off the ferry at around 7:30 p.m. Saturday night and found our way through the starlight to Caitlin and Fred’s in Fort Rupert, a suburb (!) of Port Hardy. Caitlin is a friend of mine from grad school who recently started teaching on the Island. We visited and rested there 2 nights before heading down the coast. We’re now in Comox, a beautiful Central Island town, where our Warm Shower hosts Doug and Cathy treated us to barbecued steaks, red wine and blueberry pie a la mode for dessert. We sure appreciated it after riding 130 km in the pouring rain! Today we’re off to Nanaimo and then Victoria for the weekend, where we’ll visit with family and plot our course for the next several thousand kilometers. Wow! Lucky you to see humpback whales! I’m so glad you’re out of the north, somehow that didn’t really seem like pedaling south – now it does.